This page provides you with Solution Architect resume samples that you can use for inspiration in writing your own resume, or for creating one through our easy-to-use resume builder. Below you'll find our how-to section that will guide you through each section of a Solution architect resume. If you are looking for someone who understands what a Solutions Architect do and can provide you with the best Solutions Architect resume sample, please look no further! We have worked with thousands of information technology leaders responsible for designing business solutions that meet technological goals, with fantastic technical expertise and leadership. They were working with stakeholders throughout their organization, collaborating with other departments and ensuring that goals were well articulated and well met, but… they could not build the perfect resume for a solution architect. Not only we have helped them with that, we have also got them the job they have always dreamt of. Let us inspire you, let’s get started! 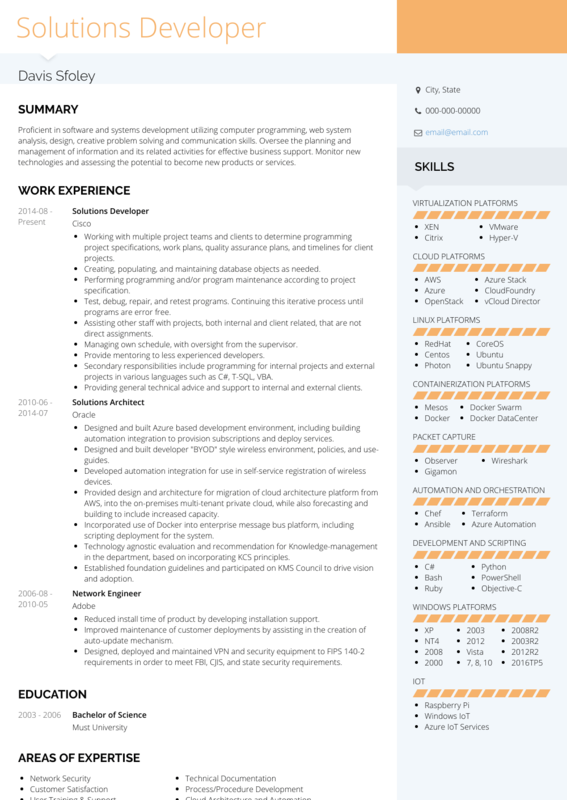 How to Write a Solution Architect Resume? This is a high-level position, so use a resume format that is both professional and well suited to showcase your technical skills and leadership capabilities. Your education is important, so be sure to highlight your academic achievements. When describing your experience, use concrete examples and measurable achievements to demonstrate the value you added to past projects. When interviewing for jobs, it is important to have a response prepared for when your interviewer says, “Tell me about yourself.” You must be ready with a brief description of yourself and your experience that gives the interviewer an idea of what you will bring to the position. The Summary section of your resume is very similar. It is a short section near the beginning of your resume that summarizes your skills and career. Fill your resume with technical terms. The work experience section of a successful solutions architect like you is the most important part of any resume. This is where you can present positions that you have held previously, beginning with your most recent role and working backwards. Your work experience must be more than a tedious list of duties. Use this section to highlight your most significant accomplishments in previous roles. Emphasize the solutions you offered that made a real difference for your clients. Showcase your most marketable skills, and use measurable achievements whenever possible. For more tips on writing your work experience, check out our detailed resume guide. Solutions architects usually have a Bachelor’s degree in computer science, information technology, or a related field. Solutions architects often have accreditations in business administration as well, although this is not usually required. Education is an important part of solutions architects’ career development, so this is an integral part of your resume. Be sure to include the name of your degree, the institution you attended, and any important awards or memberships that will help your application. Finally, if you are looking for the best Solutions Architect resume templates, you should check this masterpiece we have been working on here : many professionals like you have successfully used it to take their career to the next level.